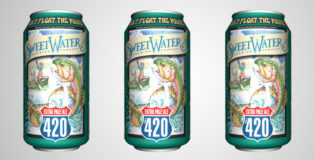 Sweetwater Brewing Company’s latest Dank Tank release Ground Score is an unfiltered dank IPA just in time for SweetWater’s 420 Festival in Atlanta, which is shaping up to be an unfiltered rip of music, beer and the culture that has made this brewery a national standout. 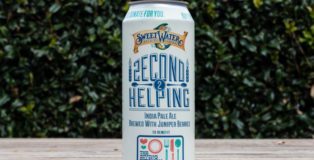 SweetWater Brewing Company’s latest limited release, Second Helping, is on the surface an interesting IPA, but it also shows a community focus. 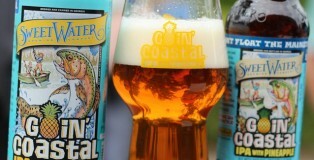 “Buy this brew, we’ll donate for you” is printed around the top of the can, but dig deeper and you’ll see they mean it! 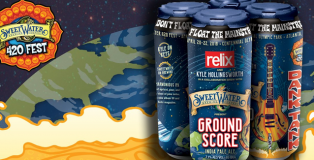 SweetWater Brewing Company takes their community focus seriously by donating 100% of their profits from Second Helping to The Giving Kitchen charity. It’s February and it may be cold, it may be wintery, but If you are like me you are already thinking about summer. You are yearning for the renewal of sunny days, baseball games and the general atmosphere that comes with a new fresh spring. 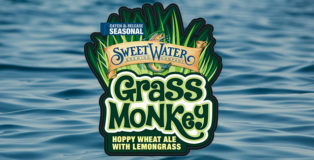 SweetWater Brewing Company is in the same mindset and their new seasonal beer, Grass Monkey, is here to usher you right into the spring. 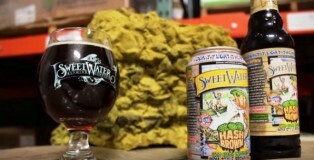 If you think this is just a simple light delicate spring beer, you don’t know SweetWater. Grass Monkey is light, but its complexity comes from citrusy hops and, in true SweetWater flair, an addition of lemongrass. If you haven’t heard, there’s a big football game on Sunday. (Dear Roger Goodell, I will adhere to licensing rights and avoid using the name of said game, but I think the game will be super!) 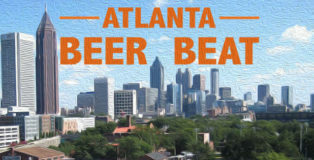 Let’s face it, for most of us whose teams failed to make it this far, the game featuring New England and Atlanta is secondary to the food, our squares, the commercials, and of course the beer. 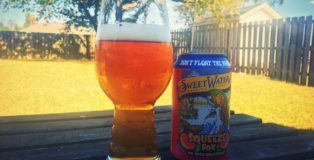 So, for those of you rooting for the Falcons, here are six ATL brews that pay homage to the Peach State’s Dirty Birds. BBQ is a deeply rooted tradition in the south. 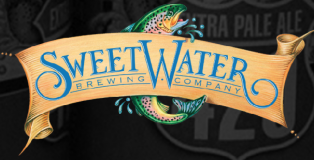 SweetWater Brewing Company asks the question we all truly want answered. Does BBQ make everything better? Settle down there is no meat or thick BBQ sauce in Pulled Porter. 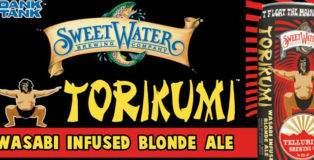 Rather, Nick Nock and the rest of the brewing staff at SweetWater Brewing Co. decided to smoke some of the malt for this beer. I’ll repeat that because it really is heavenly to read. 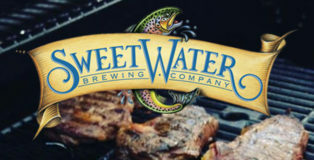 Nick Nock and the SweetWater Brewing Co.’s brewing staff decided to take some of their base malt down to Fox Brothers BBQ, one of Atlanta’s top BBQ spots, and smoke that malt and then make Pulled Porter. Genius! 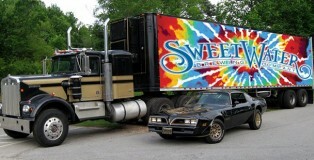 The 3-day long SweetWater 420 Festival in Atlanta has become a celebration of music, Mother Earth and Georgia’s largest brewery. 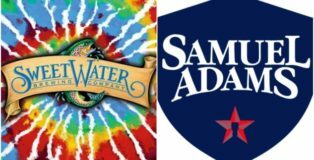 Tucked in between the two larger music stages, you’ll find the SweetWater Experience tent, where beer education — and special one-offs that you often won’t taste anywhere else – live. 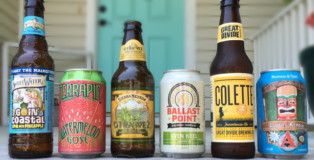 Home brew sessions, visits from hop farmers, and Q&As with SweetWater Co-Founder and Chairman Freddy Bensch are featured, but the most popular event each year is the beer and cheese pairing. 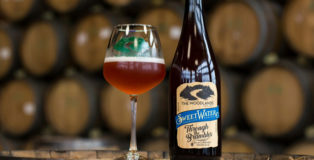 19th Anniversary Ale | SweetWater Brewing Co.
Atlanta’s SweetWater Brewing Company is staking its claim on the West Coast, putting a twist on the whole craft breweries moving east trend. 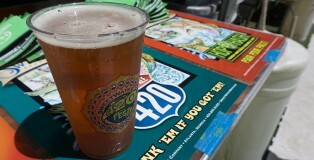 The SweetWater 420 Fest rolled into downtown Atlanta April 17-19 — and so did big time thunderstorms. 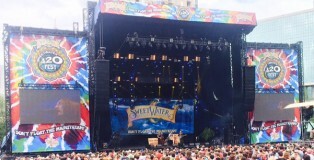 It had rained in Atlanta every single day of the week leading up to the festival’s kick-off Friday. The weather left Centennial Olympic Park, home of the 1996 Summer Olympics, a virtual mud pit. Even the walkways were a slip ’n slide of muck. 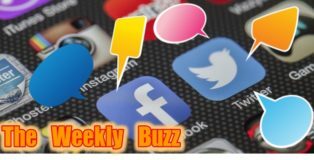 Christmas songs play on the radio way too early and holiday sales seem to go up before the kids have even picked out their Halloween costumes. 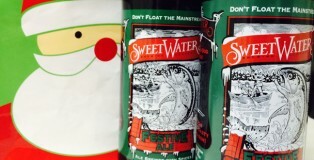 But as annoying as starting Christmas too early can be, SweetWater Festive Ale could be released on the 4th of July and I’d be okay with that.